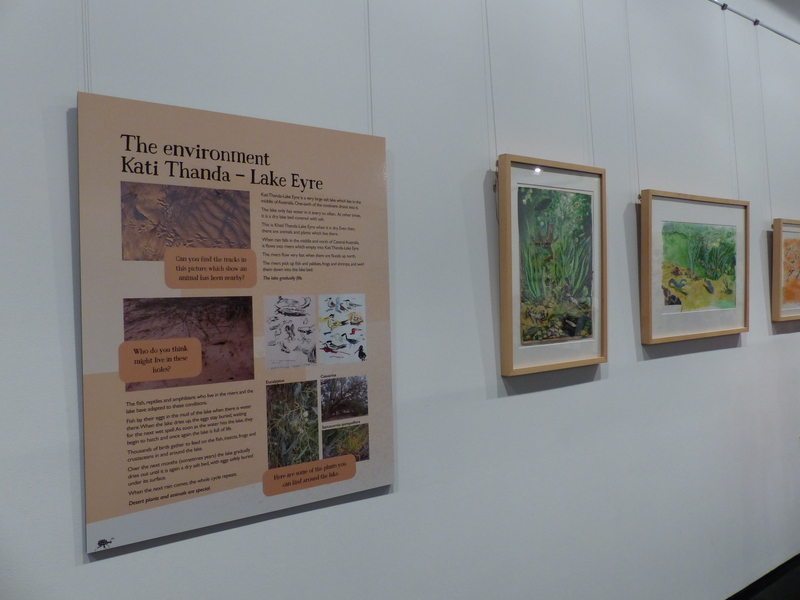 Tonight I attended a lovely launch of the exhibition Kati Thanda-Lake Eyre, artwork based on the beautiful picture book Desert Lake by Pamela Freeman and Liz Anelli. Hosted by the Newcastle Region Library the launch was a popular event, with people crowding into the Lovett Gallery to help celebrate. With drinks and nibblies provided there was plenty to keep you entertained before the launch began, including a kid’s craft table where kids could cut out paper and glue new creations together to form their own artistic pieces. Maclean’s Booksellers were in attendance selling copies of Desert Lake as well as Liz’s other work Howzat, and Liz was willing to sign your copy if asked. With enthusiastic chatter and live music playing in the corner the mood was one of celebration and it was a great start the evening. The gallery walls displayed Liz’s beautiful original artwork, gorgeous images filled with colour and wonderful scenes. What amazed me most were the vivid colours and the incredible detail in each and every picture. I found myself staring at one of them for awhile just taking in the intricate nature of the image and all the tiny details you could see. Looking closely the images looked rough but they were evocative, just like the real scene. There was a mixture of greens and blues alongside the coloured sky and red/brown ground and it really highlighted how diverse the environment can be. 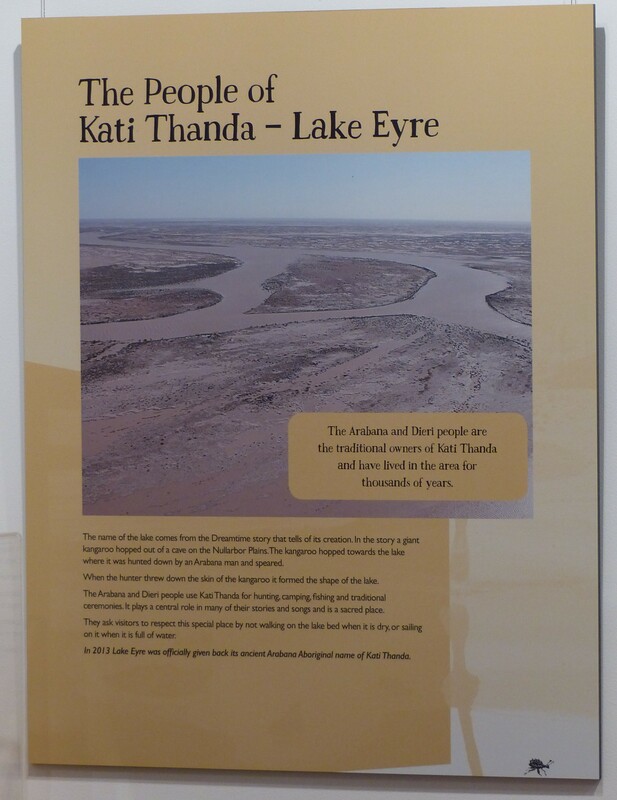 Alongside Liz’s work were interesting information boards about the real Kati Thanda-Lake Eyre and the surrounding areas, including information about the wildlife, the people, and the environment. 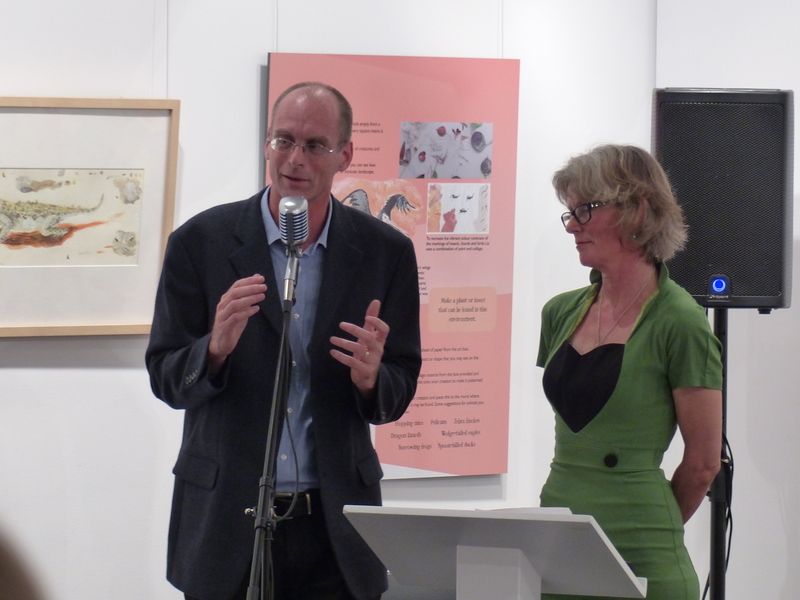 When the official side of the night began Newcastle’s Lord Mayor welcomed everyone before ABC’s Manager of Broadcast Content Quality, Philip Ashley-Brown, came out to explain how Liz’s exhibition came about as well as talk about some of her previous work. Philip, like me, made a comment about the amount of detail in Liz’s work, saying there is so much going on, something Liz laughed about later saying she always feels she isn’t putting enough detail in. One thing Liz said which I found interesting was her comment in response to Philip asking about whether she gets caught up in the tiny details. Liz said that when you’re drawing you’re the only person in the world caring about that something. Which is quite an interesting observation I thought, and very true of so many things whether it’s art or writing. Liz explained that you don’t need to go to the outback to appreciate it, and she hoped that if one child can see that in her book, then her job is done. Judging by the beautiful pieces she’s created it’s hard not to appreicate it. She has capture the beauty and reflects reality remarkable well. One thing she said she had learnt whilst researching the book and on her travels around the centre of Australia was that not only is it big, but sometimes very quiet. 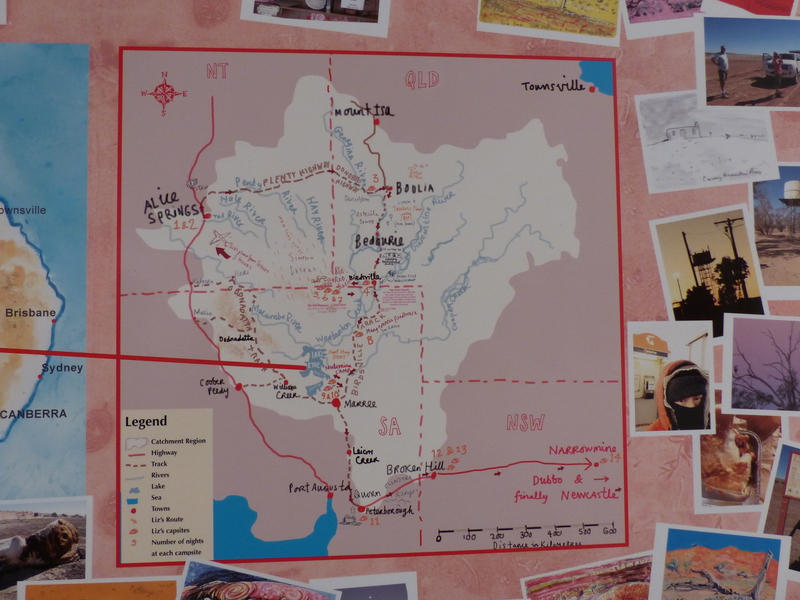 There was a large information board that was fairly remarkable that showed Liz’s journey around Central Australia, from Alice Springs to Coober Pedy, Bedourie, Marree, and all around Lake Eyre. Surrounding the impressive map were photos of her trip and all the things she had seen there. 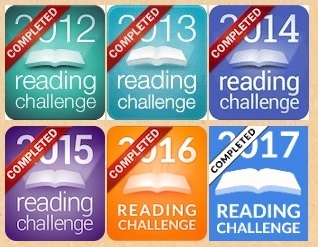 It was an extensive journey and one well portrayed judging by the final artwork. Overall it was an enjoyable night. It was wonderful to get a chance to see Liz’s original work up close and hear about her research and see the results of her travels. 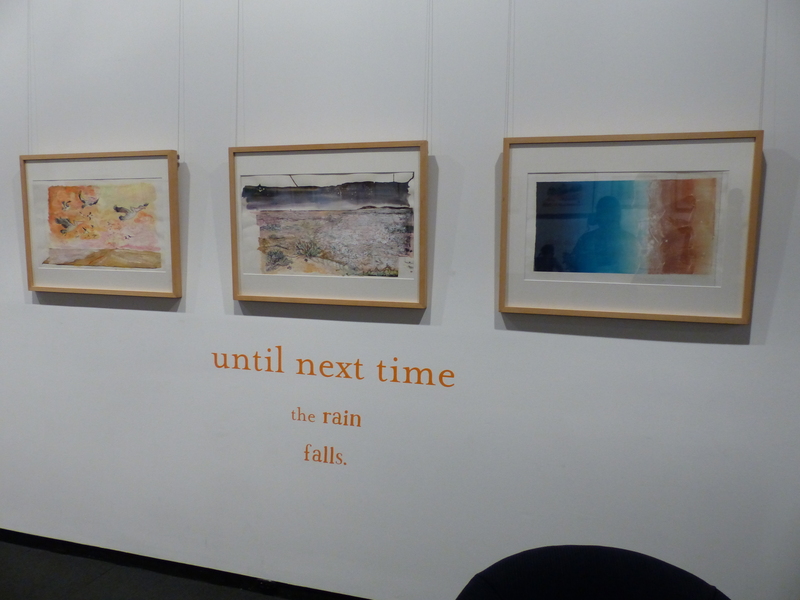 Newcastle Region Library is running the exhibition from 29 March to 14 May if you would like to check it out. Original artwork, sketches and studies by Liz Anelli of the Nature Story series book written by Pamela Freeman for Walker Books. 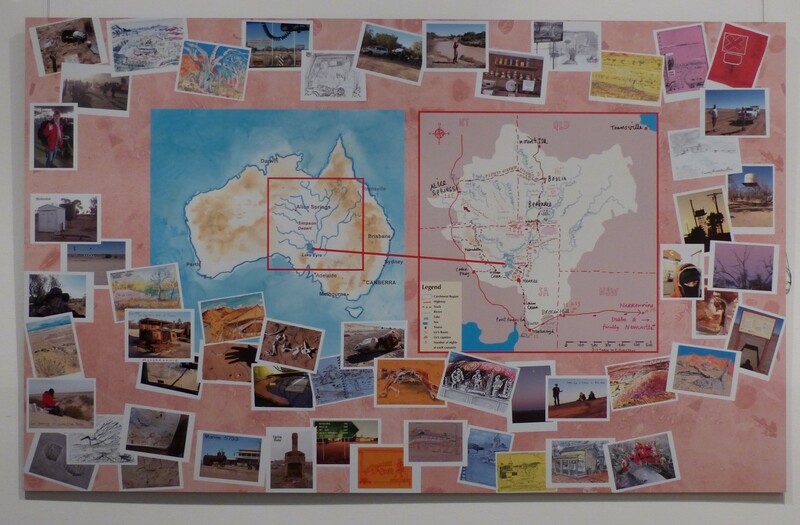 Follow the artist’s research journey around the Central Australian Outback. Liz Anelli began her children’s book career in 1986 with the Scrapyard Monster (MacDonalds), a tale set in the scrapyard that her United Kingdom art school overlooked. Since then she has illustrated 15 books and numerous articles for newspapers, websites and magazines. She moved with husband Mario to Australia in 2012 and quickly fell in love with the colourful city of Newcastle. Her first major project was a huge illustrated map for The Maritime Centre telling the story of The Port in pictures. 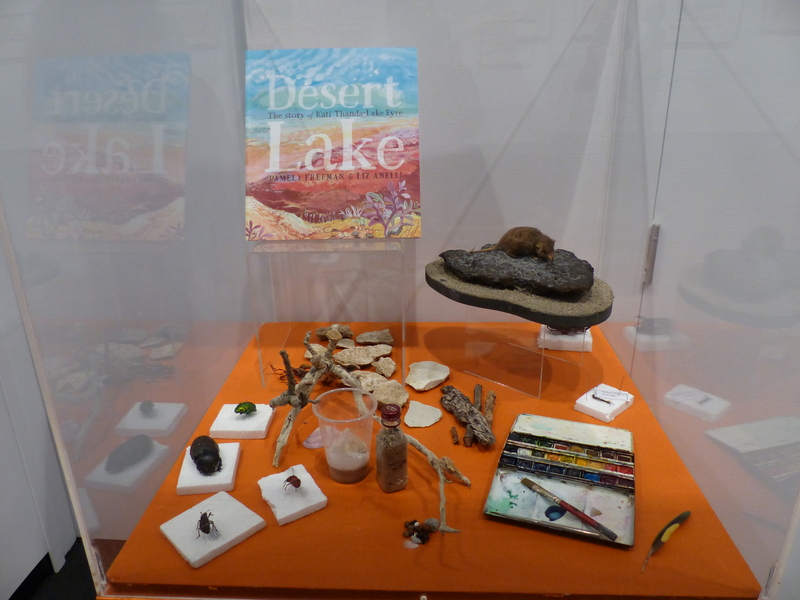 An ASA Children’s Picture Book Award allowed her to research Desert Lake (Walker Books) and she spent her May Gibbs Trust Fellowship 2015 in Adelaide developing new manuscripts. One Photo (Penguin Books) will be published in September 2106.